Just 2km (1 1/4mile) from the center of Mykonos Town, the 'A Hotel Mykonos' welcomes you! Inspired by the high aesthetics and hospitality of the traditional old mansions, it offers ideal accommodation, ensuring the highest level of services at a very reasonable cost. Design Suites, Cozy Rooms, beautiful green gardens, a pool with an amazing view to the nearby bay and a Pool Bar & Restaurant with homemade tastes and delicacies are combined to create the most memorable holidays of your life! It is found at a marvelous, quiet location, only 200m from the beautiful beach of Papikinou. Built with respect for the traditional Cycladic architecture, Aggelos Studios is 800m from the port of Adamas and 5km from the airport of Milos. All the units including the apartment are newly constructed and offer their guests all modern amenities. They feature a double bed, sofa, kitchen with all the necessities, bathroom, WiFi, television, air-conditioning, and a private veranda with a marvelous view of the sea or mountain. The Agnanti is located in a prime position in the Kastro area, on the island of Sifnos. It has a clear, fantastic view of the sea and the surrounding islands. It is built according to the Cycladic architectural style and was recently renovated with care. It offers its guests all modern amenities. It features comfortable and fully equipped rooms with A/C, fridge, TV, telephone, free Internet access (WiFi) and parking. The Agnanti is open for Easter and from the 1st of June until the 10th of September. It is found at a splendid location just 150m (164yards) from Paraga, one of Mykonos' most beautiful beaches with crystal blue waters. It is 5km (3 miles) from Mykonos Town (Chora) and 3km (2 miles) from the airport. A brand new complex with 11oi luxurious studios and apartments all uniquely decorated in true Mykonian style. They can accommodate 2-4 persons accordingly. All are fully equipped and feature a veranda with an incredible sea view, A/C, TV, safe-box, fridge, kitchenette with all necessaries, sitting area and parking space. The suites feature a separate bedroom and kitchen. "Ammos Exclusive Studios & Apartments" is located in the beautiful, serene area of Laguna beach on Naxos island. It is 1km (0,6 miles) from Naxos Town and 250m (273yds) from the beach. It is a fully renovated complex with 10 studios, swimming pool, pool bar, spa, Internet corner, parking and a wonderful, green garden full of flowers. The studios are double and triple, and there are two apartments, ideal for families. Each studio has its own style and all offer a kitchen with all the necessary appliances, bathroom, A/C, fridge, coffee- maker, telephone, music, cable TV, Wi-Fi and veranda with a unique view. The "Amorani Studios" complex is located in Batsi on Andros island, at a distance of 400m (1300ft) from the beach and 250m (820ft) from the town centre. Built ampitheatrically, overlooking the [only] green area of Batsi, they offer a lovely view of the village, the sea and the beautiful sunset. All rooms are fully equipped with kitchenette, fridge, bath, TV, telephone, air-conditioning, spacious verandas and private parking. The island of Santorini is a truly magical and mystical place and the Blue Dolphins Traditional Apartments have been planted right in the middle of this magic. Located in Firostefani, 10 minutes walking distance from the centre and overlooking the famous volcano and the Aegean sea, you will be able to feast on the tranquility of the nature before you, and take a break from everyday routine. Check our special free car offers. Online availability & secure reservations. Dimele Rooms & Studios welcomes you to the cosmopolitan island of Mykonos, and is ready to offer you a marvelous and pleasant stay in its newly renovated rooms. 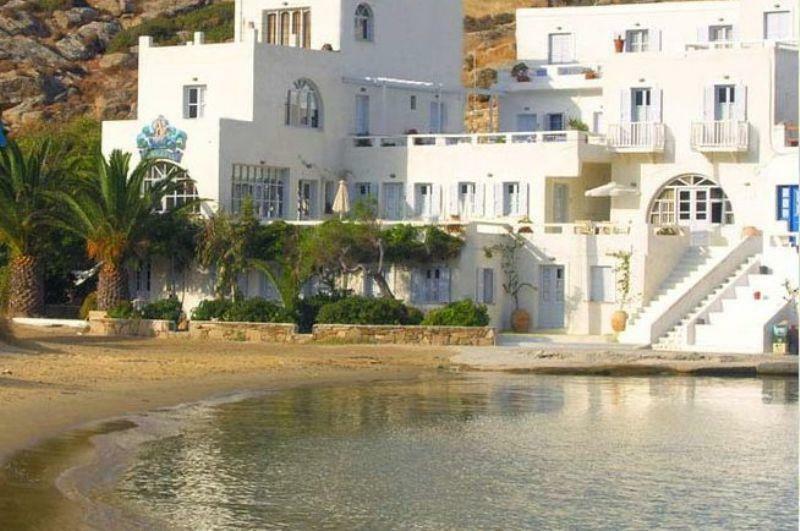 It is located exactly in the town of Mykonos, from where you can visit all the quaint spots. It is only 100m from the central bus station. It is our pleasure to cater to you in our warm, hospitable environment, in one of the three types of rooms, such as Superior double room, with a sea view, Superior double and Superior triple room. "Dmitris Studios" is built according to the traditional Cycladic architecture. Located in the resort of Naoussa on Paros island, on the sandy beach of Agioi Anargyri. All studios and apartments are spacious, can accommodate an extre bed, offer a breathtaking view of the sea, are air-conditioned and feature kitchen, fridge and TV. For its guests, "Dimitris Studios" also offers parking space. "Fragoulis Village" is a lovely seaside complex located 3km from Parikia, between Agia Irini and Parasporos on Paros island. It offers a magnificent view of the sea while the beach is only 10 minutes on foott . The complex features a private garden with swimming pool for children and adults, children's playground and restaurant. It features rooms, suites, studios and apartments. All rooms are air-conditioned and have balconies. Studios and apartments also feature fully equipped kitchenette. Galaxy Suites & Villas is located in Imerovigli on Santorini island, at the top of the Caldera with a fantastic view. It is built according to the architectural style of the Santorini and offers its guests luxurious, traditional and modern suites of different kinds that can accommodate from 2-6 persons. All the suites have a wonderful style, are comfortable and fully equipped. They feature TV, A/C, mini bar, kitchenette, telephone, outdoors and indoors Jacuzzi and a view that takes your breath away. Germanos Studios is found at a splendid location directly above Mykonos Town, on the cosmopolitan island of Mykonos. It is built according to the traditional architecture of the Cyclades islands, at an elevated spot and features an amazing view of the Aegean Sea and the beautiful sunset. It is a lovely complex that offers its guests rooms that can accommodate between 2 and 4 persons accordingly. All rooms are spacious and fully equipped with all modern amenities. The Glarontas Apartments are located on Syros island, at the foot of the eastern side of Armeos hill and are 200m (656ft) from the beautiful Galissas beach. They offer their guests 4 two-room apartments with four beds, a one-room studio with three beds and a studios with two beds. All the accommodation is fully equipped and features kitchen with all the necessary appliances, bathroom, telephone, TV, A/C and daily cleaning. The Glarontas Apartments also have a parking area, garden and BBQ. On Ios Island "Gorgona Apartments", an A class complex, is located on the sands of Mylopotas Beach, by the sea, offering a breathtaking view. This complex, with its Aegean-Cycladic architecture, evokes a feeling of traditional charm. The apartments and studios are conveniently located 5km from the port and just 3km from the capital of Ios, Chora. Ikies Traditional Houses is a special type of hotel. Its small size, exceptional location on the edge of Santorini's Caldera, traditional design and professional operations result in a rare blend of intimate and personalized service. From the signature breakfast served on your personal terrace to the afternoon turndown service while you sip a sundowner, our staff's attention to your every need and desire will make you feel pampered and relaxed. "Iliana Apartments & Studios" is located on the hill of Parasporos and has a unique amphitheatrical view of the bay of Adamas. It is built according to the traditional architecture of Milos in a fabulous, lush green 3/4-acre property. It is a small complex offering spacious apartments and studios where you can spend your vacation as if you were at your own country house. The garden is verdant and has an outdoor area for common use with a stone oven where you can cook a meal with your friends. The apartments have easy and immediate access to all the beaches of the island. "Livanios rooms" is located in Adamas on the island of Milos, 150m (164yds) from the main square with its sea view and 500m (546yds) from Lagada beach. Combining traditional island architecture with present day aesthetics it is an ideal choice for both couples and families. All the rooms (studios, traditional, apartment) are equipped with A/C, Wi-Fi, satellite TV & music, small electric cooking top, fridge, CD-MP3 player, digital safe-box, fully equipped kitchen (in the apartment only) large bathrooms and verandas with outdoor furniture. Villa Maria Rooms and Apartments is located in the village of Akrotiri in southern Santorini. Its chief attraction is the panoramic view of the Caldera, the volcano, the unique sunset and its quiet and friendly environment. Villa Maria offers 11 rooms (double and triple) and 3 studios (2 doubles, 1 triple). All rooms and studios feature A/C, bathroom, fridge and private veranda overlooking the volcano and the characteristic blue of the Aegean Sea. Swimming pool on the premises. Mina Studios is an authentic traditonal family complex, which is located at an exceptional location, between two beautiful beaches of Platis Gialos and Psarou beach. Platis Gialos is a very popular beach in the southern part of Mykonos island, one of the longest beaches of the island. Another extremely popular beach to the south of Platis Gialos is Psarou beach. Mina Studios is 3 1/2 km from Chora of Mykonos, 3km from the airport, 4km from the port, only 100m from the beach of Platis Gialos, and 300m from Psarou beach. "Mykonos View" awaits you on the slopes of a hill looking down on the fashionable main town of Mykonos and the sea beyond. Clusters of houses harmoniously form a multi-coloured collage made up of various shapes, numerous materials and levels with the swimming pool at the highest point. At the "Oniro" restaurant-bar, a work of art, the sunset affords a truly incomparable experience!